FRESH AGAIN is an extremely concentrated Odor Neutralizer that can be used on surfaces and in the air on all odors. It chemically neutralizes any foul odor. HOUSEHOLD DEODORIZER: Fresh Again is the ultimate solution for neutralizing foul odors inside of your home. The ocean mist scent is perfect for couches, sofas, fabrics, curtains, clothes, shoes, boots, mattresses and much more. Fresh Again will leave your household smelling nice and fresh! MULTI-PURPOSE USE: Fresh Again can be used just about anywhere to eliminate foul odors where ever you might find them. This industry leading deodorizer is also great to use as a car deodorizer, shoes, bathrooms, attic, locker rooms, garbage receptacles, air conditioner return vents, closets, smoke damaged items, patio, the possibilities are endless. 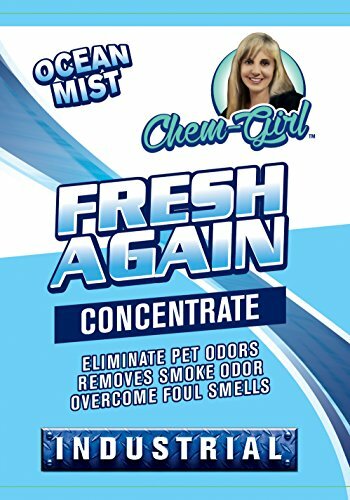 CONCENTRATE FORMULA: Fresh Again provides great value, 2 ounces of concentrate formula makes 1 quart of deodorizer that eliminates unwanted foul odors. Fresh again doesn't just mask odors, it removes all together. For hard to eliminate odors we recommend using 4 ounces per treatment (as needed). INDUSTRIAL STRENGTH: Fresh Again is a concentrated deodorizer that chemically neutralizes odor, either in the air or directly on hard or soft surfaces. The strength of Fresh Again makes removing unwanted smells easy. Eliminate the most stubborn odor anytime, anywhere! CHEM-GIRL PROMISE: Fresh Again is proudly made in the USA, this product has been lab tested and industry approved. Chem-Girl products are the ultimate proven solutions for all your household cleaning needs, Happy Cleaner, Gone for Good, Destroyer, All Mighty and OxyPro. If you have any questions about this product by Chem-Girl, contact us by completing and submitting the form below. If you are looking for a specif part number, please include it with your message.